Janey Pringle and her husband Dave have been in Tauranga since 1988 and love their piece of paradise in Te Puna, where they raised four children, a menagerie of animals and grew the family business. Janey is honest, hardworking, reliable and organised, attributes and skills honed from developing the family beekeeping business over the last 30 years. Janey’s real estate experience and her valuable business skills will provide you with the benefits of knowledge, skill and experience when it comes to selling your home. She knows the importance of getting the business decision right the first time and would love the opportunity to help you with your valuable real estate decisions. After 30 years as a Medical Microbiologist and living in Auckland, I felt the need for a new challenge in my life. Not only did my family and I pack up and move cities after living there for over 30 years, I also completely changed my career path. Real Estate has always been at the top of my list, I am thrilled to have completed the course which I thoroughly enjoyed and am super excited about what the future may bring! I bring many attributes to the profession. My confident, outgoing, and friendly personality is one of my strongest qualities allowing me to develop strong working relationships with people to gain their trust. I have great work ethic and time management skills. I am loyal, trustworthy, highly organised and am great at problem solving. I will always provide the most up-to-date and accurate information and sound real estate advice to my colleagues, clients and customers. I will continually research new technology and ideas to help improve and make selling and buying a home easier, faster and an even more positive experience. These values are what make me stand out as a Real Estate Professional and drive me to become the best within my chosen career path. Andrew is a sales & marketing professional who has an extensive background in banking and finance. He has held a number of senior management roles within New Zealand’s leading financial institutions. This background combined with his real estate knowledge and experience enables him to work successfully with a broad range of clients, offering a truly professional and caring approach to selling what is often a client's largest asset. Andrew takes this responsibility seriously and is dedicated to achieving the best sale price the market will deliver. Miles' diverse background brings multifaceted skills and experience to your property transaction. Having a BArch, and working in that industry along with plenty of 'hands-on' construction, he brings a designer's eye and construction understanding to real estate. In addition he has worked for six years in the charitable sector - much of that time looking after high value, high capacity donors. Miles knows how to engage with people to achieve outcomes, and has plenty of resilience. Success in buying and selling property of his own completes his picture. His energy and tenacity will see your sale through to its successful conclusion. Lance brings a wealth of business and real estate experience to the Proppy brand. He has started and sold his own businesses, sold real estate both as an agent and himself, been self-employed for over 25 years so he really does understand you need to be prepared to work to achieve. His approachable style makes him easy to work with and his keen awareness of the situation helps find solutions where others see obstacles. Since leaving the UK nearly 20 years ago, yes, a Pom but definitively not a winging one – he has thoroughly embraced & enjoyed the Kiwi way of life. Lance says, I honestly believe in Rodney, we are truly lucky to have probably the best place to live & work." For a solution focused agent look no further, once you’ve got me on your side I don't let go until the deal is done! Lastly just like New Zealand on the sports field, ‘Proppy’ might be small but we pack a big punch, results count for nothing, unless you win! For a no obligation chat give me a call today." I have provided professional services in health, education, and community over the past 20 years. Originally from Franklin, I am excited by the growth and potential of our district. Having many years of experience in property investment and an interest in the evolving real estate sector, I am proud to provide a transparent and empowering service to my clients. From your first enquiry through to the satisfaction of buying/selling your property, I work to make your experience with us as stress free and as simple as possible and I work hard to get results. Viv has been involved in all facets of the building industry from office management through to high end residential developments and lifestyle subdivisions. Joining Proppy is a natural continuation of a life time of skills associated with the real estate industry and fits with her innovative approach to business. She is a people person and loves putting a deal together! Viv moved to Tairua on the Coromandel Peninsula permanently in 2007, enjoying the Tairua lifestyle and being actively involved in the Coromandel community. She is also an Emergency Medical Technician (EMT) for St John. Five years ago, my husband and I threw a dart at the New Zealand map after deciding we wanted to leave the big city. The result was us relocating to Tairua on the Coromandel Peninsula. Our lives are significantly better for making that decision as this part of the country is exquisitely beautiful, full of amazing locations and homes, and from our experience we enjoy encouraging others to either live or spend their precious holidays on this amazing peninsular. When I started in the Real Estate industry, I was under the assumption I could make a difference in my clients lives by providing quality service while utilising my passion for property and marketing. What I found, however, was that the old school real estate system was burdened with paperwork, unnecessary stress and clients who felt they were not getting good bang for their buck. When I discovered Proppy, I realised that this revolutionary platform was just what clients were asking for. This system has turned the stuffy difficult legalities into something simple and manageable, putting the client back in full control of buying or selling their most valuable asset. The process speaks for itself - once you have purchased or sold a home through Proppy, you really won't want to do it any other way. Call me, I'd be happy to share more details about this exciting system for selling your property here in the Coromandel. Proppy is the future of real estate. With an innovative platform based around the latest in technology, we are driven to change the face of the real estate world, for both buyers, sellers and agents alike. We are a growing network of real estate agents across New Zealand. Join Proppy to access our powerful and exclusive technology platform that will drive leads for you and access our marketing tool kits, exclusive training, mentoring and networking events. We are looking for Real Estate agents who are entrepreneurial in spirit, professional, capable and passionate. Openness and transparency are key drivers in our business and culture and ultimately we believe in the power of human connections which ensures our team succeeds. Proppy is a challenger brand. Help us to drive change and innovation across the real estate community. Join our team today. Peter started his real estate career in Australia in 2004, initially as a sales person before establishing and managing his own boutique agency in Far North Queensland. After returning to New Zealand in 2008, as a real estate agent he was involved in many multi-million dollar property transactions and has sold over $100 million worth of property. He is a Licensed Real Estate Agent (REAA 2008), licensee number 10016736. Personally, I bring more than 15 years of sales and marketing experience to the Proppy team. When I see a property, I see a home and connect not just at a sales level but bring an emotional intelligence to the room. Sales and marketing is in my blood and I believe that I deliver the all-important marketing flair needed to sell your property. I have experience with sales campaigns on social media and can create campaigns online to suit your home and help you achieve the best sale price possible. I have personally bought and sold property in NZ and in the UK and know what it takes to get a great result. I am a co-founder of proppy.co.nz and I believe that it is the way of the future. Tyson has more than 20 years of banking experience and accounting expertise, including senior institutional and retail banking roles for Westpac, BNZ and HSBC (in the UK). This experience, combined with being a licensed real estate agent (REAA 2008), has given Tyson unparalleled insights into the residential and commercial property markets, from decision making processes, through to buying/selling, through to arranging finance and legal agreements. Jamie has lived in Rotorua for most of his life and knows it’s a great place to live and play. 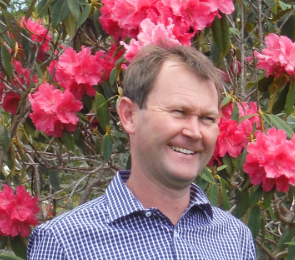 He makes the most out of the forest, lakes and sporting facilities and has an in-depth knowledge of Rotorua and the surrounding areas. Jamie spends a lot of time in the community getting involved in kid’s sports teams including being an active committee member for the local Eastlake football club. Jamie has a vast amount of experience dealing with business as a consultant and is experienced selling and purchasing property over a number of years. Jamie has an honest upfront approach, is a skilled negotiator with the knowledge skill and commitment to work with you to sell your property. Jamie is keen to help you with your next adventure, so contact him now for all your Real Estate queries. Catherine has been an active member of the Timaru community for the last 40 years and has the best network you could ask for. She knows property and has a vast experience of buying and selling personally. She has a keen eye for detail and can see a vision with a house and will help you with tips to get the best price possible. I owe my successful sales career to what some might consider an unconventional upbringing. I grew up in the service and sales industry in the UK, then spent my early teens traveling around and residing in numerous countries within Europe, finally settling in the Spanish Province of Andalucia. During that time, I met and sought advice from many successful business people from all walks of life, whose experience I took and used in my own business dealings over the years. My experiences in investing and new home builds has lead me to the real estate industry, which, over the past few years, I have established a sound reputation of being honest and working with integrity. Being a people person, I build and maintain strong working relationships with each and every client. It gives me great pleasure to negotiate a fair deal and a successful sale. My goal is for my clients to feel comfortable and excited throughout the buying and/or selling process. I am a passionate practitioner in the art of promoting the property. After seven years in the industry, it's important for me to keep asking if the world still needs real estate agents. In 2018, the answer is still yes. But things have changed. A lot. Proppy is the way of the future and I am excited to be part of the team and to improve the way my clients buy and sell real estate. 1. How well will they present my property to the world? 2. Can they show a good track record of negotiating skills for their last 20 sales? 3. Can they justify their fees? I'm confident in answering these questions because I love efficiency. My goal is to work smarter to save you money. The fact is, I've spent the past few years fine-tuning a method of selling houses that have quietly saved my clients over $180,000 collectively, compared to traditional fees, while still getting great results. I enjoy a happy life in Fairfield with my beautiful wife and three awesome kids, and drive around in a shiny Toyota. I can quite often be found at the happeningest cafe in town, Yalla Yalla Cafe. Call me to find out how to get the job done better, for less, by someone who's bothered to look behind the green curtain. Passionate, driven, intuitive, yet friendly and open, Hans brings a wealth of traditional real estate and banking background experiences to help you navigate through today's online and complex information age. A qualified specialist in Financial Economics and Marketing Communications within Auckland international institutions and with more than $30 million in managed accounts in his brief career, you will have his invaluable experiences and tech savvy support to get your valuable asset sold. Whether it's apartments, lifestyle blocks, luxury estates, section blocks, units or residential homes, he is more than happy to bring you up to speed with everything real estate. Ask Hans! With a professional approach & can-do attitude, Karen’s passion for real estate is evident. Her integrity is beyond reproach and nothing satisfies her more than being able to provide a quality service, expertise, knowledge and caring support for a great real estate experience. An innovative “point of difference”, her Interior Design business provides not only the “how to” in presentation for maximum impact, but the “can do” with products and tradespeople to complete both inside & outside projects. Home staging is also available for partially furnished or vacant properties. Karen is committed to helping clients achieve the desired outcome in both residential and lifestyle real estate markets. Tony was born in Tauranga and raised in Mount Maunganui which people often call paradise. He adores the fit, active lifestyle of the Tauranga community and loves being apart of its rhythmic, artistic and vibrant culture. New to the Real Estate industry, however, not new to the city of Tauranga. From the best surf spots, to where to get the best dumplings in the city, to the growing new and exciting changes, Tony makes it a point to know what is happening in the city. Tony aims to achieve the best possible outcome for his clients and will work diligently to do so as he understands that regardless of the type of house you are selling, he will make it his mission to achieve the best results for you.